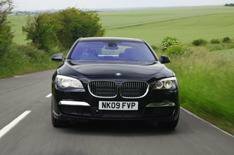 BMW 740d driven | What Car? BMW's 7 Series gets a power boost and greener credentials with the company's latest 3.0-litre twin turbo diesel engine. The flagship 7 Series will next month get BMW's new twin-turbo version of the 3.0-litre six-cylinder diesel engine and it threatens to obliterate anything the competition can offer. The unit's numbers are impressive enough 301bhp, 444lb ft of torque from just 1500rpm, almost 41mpg and CO2 emissions low enough to put the car in the 27% company car tax band but these figures tell only a fraction of the story. You should see how it goes. It's a flyer, and makes the car feel as though it's shed a couple of hundred kilos, too. The trick is in the twin-turbo arrangement a small one to aid punch at low-to-medium revs and a larger one to provide thrust when it's up and running. Together, they give the 740d fantastically linear responses. With so much torque it makes you wonder why BMW will go to the trouble of swapping the current six-speed automatic gearbox for an eight-speed version next year, until you realise this will allow even longer gearing, cutting fuel consumption and emissions even further. The engine will be available in both standard and long-wheelbase models, and with either SE or the new M Sport trim. M Sport introduces no suspension changes, since the car's interactive chassis control already lets you pick and choose the set-up, but it does give you the option of 20-inch alloy wheels to go with the revised body styling and trim. It might just be a bit too stiff-riding for some people this way, though. This is a diesel engine? You're kidding.